Photographed at the offices of the Lamp Post Group on Monday, Apr. 4, 2016, in Chattanooga, Tenn., Allan Davis, Barry Large and Ted Alling, from left, are the founders of Access America Transport, a company they sold in 2014. They have recently launched Dynamo, a company that is a logistics accelerator. Just as Paris in the center of fashion, Silicon Valley the focal point for technology and Nashville the home to country music, Chattanooga is emerging as a capital for trucking and logistics. A Chattanooga venture fund organized by key entrepreneurs representing one of Chattanooga's most successful logistics startups is helping the city stake its central role in ground shipments. Santosh Sankar talks about Dynamo, a logistics and transportation accelerator launched by Access America founders. Chattanooga is within a day’s drive of nearly half the U.S. population and its Gig internet connections and rail, trucking and inland ports have made “Choo Choo city” a central location for logistics. › Trucking: Chattanooga is home to two of America’s top 10 long-haul trucking companies, U.S. Xpress Enterprises and Covenant Transport, and other smaller trucking companies such as Tranco Logistics, Shah Trucking and the North American hub for Sese’ Logistics, plus the home of major regional distribution facilities operated by FedEx and United Parcel Service. › Warehousing, shipping: Chattanooga is the headquarters for Kenco Inc., the biggest privately held warehousing company in America, and is home to Tranco Logistics, Schnellecke Logistics USA and Let’s Go Express, Coyote Logistics and Avenger Logistics. Amazon operates one of its biggest fulfillment centers in the Southeast in Chattanooga and another in nearby Charleston. › Logistics support, technology: Coyote Logistics, Steam Logistics, Reliance Partners, Workhound, Locatible, LMS (Logistics Made Simple), Riverside Transport and Trident, among others, operate growing local offices handing freight forwarding, scheduling, insurance, labor, job training and other industry support operations for the trucking industry. › Rail and water: Chattanooga is home to maintenance and switchyards for Norfolk Southern (the Debutts Yard) and CSX railroads along with the Riverport and Serodino Shipyard on the Tennessee River. The Dynamo Venture, which the former owners of Access America organized three years ago to help launch more businesses that bring innovation and technology to freight shipments, recently brought to Chattanooga 20 startups from around the globe. Billed as Founders Camp, the weeklong event helped entrepreneurs pitch their ideas and businesses to both investors and customers in Chattanooga's growing logistics industry. The startup and early-stage businesses ranged from maintenance and refueling services to artificial intelligence companies writing the software for autonomous urban driving. Others are developing new software and technologies for better means of staffing, scheduling, routing and loading trucks. Still other startups that participated in the Founders Camp provided better sourcing for equipment, and insurance underwriting or protection for produce or security-related shipments. "The program brings startups from across America and Europe here for a week-long program to help these founders build a better business and drive more traction or revenue opportunities," says Santosh Sankar, co-founder and director of Dynamo. "The 20 founders were selected for the camp to get insights and advice from proven operators and managers who have scaled startups and enterprises. We're able to bring in founders and corporations and help them engage better with one another." 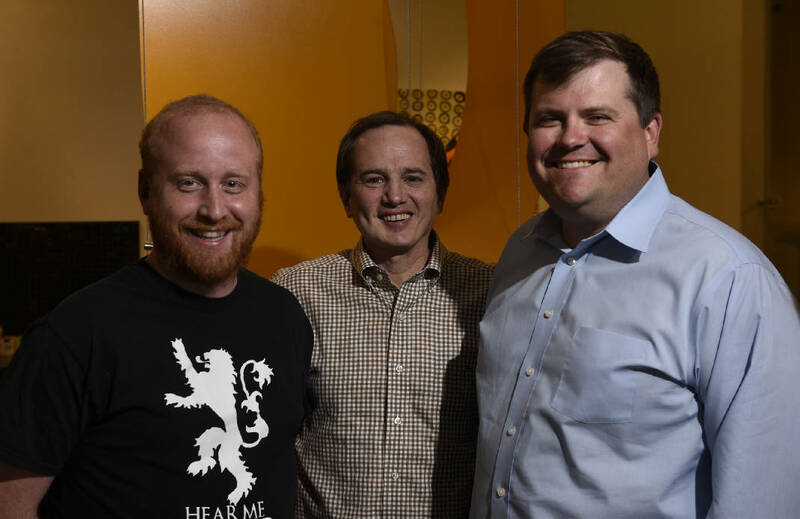 Born out of the offices of the Lamp Post Group, Dynamo is Chattanooga's biggest venture fund, having raised $18 million in 2016 for early-stage businesses serving the logistics industry. The week-long Dynamo camp is a replacement for Dynamo's previous 10-week accelerator program, which the venture fund ran during previous summers. The tech startups, each of which is seeking a stake in the growing logistics business with new inventions or technologies, got to see some of what Chattanooga has to offer at companies such as Covenant Transport and EPB. During the final two days, the founders met one on one with potential customers and partners for their ideas. One of the founders pitching a business idea during the Founders Camp was Pablo Carvalio, who started Tobly as a kind of Uber for forklifts and other construction rentals. Tobly partners with smaller rental companies and equipment owners willing to rent out their supplies and give users an alternative to major rental operations. The New York-based digital startup has grown rapidly in the retail sector and is trying to expand into logistics. "The Founders Camp is a great chance to allow us to introduce our ideas in another industry, and we've heard great things about Dynamo and its success in helping to reinvent this industry," Carvalio said. "As a startup, it's hard to get access to so many potential customers and investors at one time. It's almost like speed dating for business." Jore Moriett, the sales manager for the Open Legacy information integration firm, said the Founders Camp "is the best event I've ever been to" in aiding startups with both contacts and sales and investment pitches. The 20 startups spent one afternoon at the body shop of Covenant Transport just up the hill from the company's headquarters in Lookout Valley. There, the entrepreneurs from around the globe could see the local trucking operation and talk with industry leaders. Covenant hosted the event as part of the company's growing effort to bring more innovation into the 32-year-old trucking firm. "We're trying to be much more innovative and this is a great event not just to hear ideas from these businesses but to help build a culture of innovation," said Richard Cribbs, chief financial officer at Covenant Transportation Group. "We had a lot of technology and IT people here to listen to these entrepreneurs and to see where partnerships might made sense. This could be an opportunity where maybe we are the guinea pig for a new product." › What it is: A venture capital and accelerator program for the logistics industry. › Start: Began as an outgrowth of Lamp Post in the Loveman’s building in 2016. › Founders: Ted Alling, Allan Davis and Barry Large (founders of Access America) and Santosh Sankar and Jon Bradford. › Capital: Dynamo raised $18 million in 2016 for investments in startup and early stage growth companies in logistics. More than half of those funds have been deployed in nearly two dozen startups and early stage businesses. › Portfolio: Dynamo has invested in Stord, Skupos, Seeva, Steam Logistics, Slope, Sennder, Skydrop, Starsky Robotics, Zeelo, GatikAI, Vector.ai, Tenderd, Workhound, Autit, Plus One Robotics, Shipamax, Sierenum, Locatible, Wise, Odyn, Numadic and SynapseMX. Ryan Rogers, the chief transformation officer at Covenant Transport, said the company is eager to learn about and potentially buy or invest in new technologies to improve its business. Joey Hogan, president of Covenant Transport, said Covenant has already partnered with a couple of the Dynamo-funded startups and is looking at other ventures. Beyond just hauling freight, Covenant and other trucking companies are looking for ways to better manage and warehouse goods and find more efficiency in how products are shipped from producers to users. Hogan thinks fully automated trucks are still a decade or more away, but new technologies continue to improve truck safety and efficiency, and Covenant and other shippers are eager to expand their range of services. "We want to be more than just hauling freight — as important as that is — and that is where we are trying to learn and explore more about the opportunities these startups and others may offer," Hogan said. 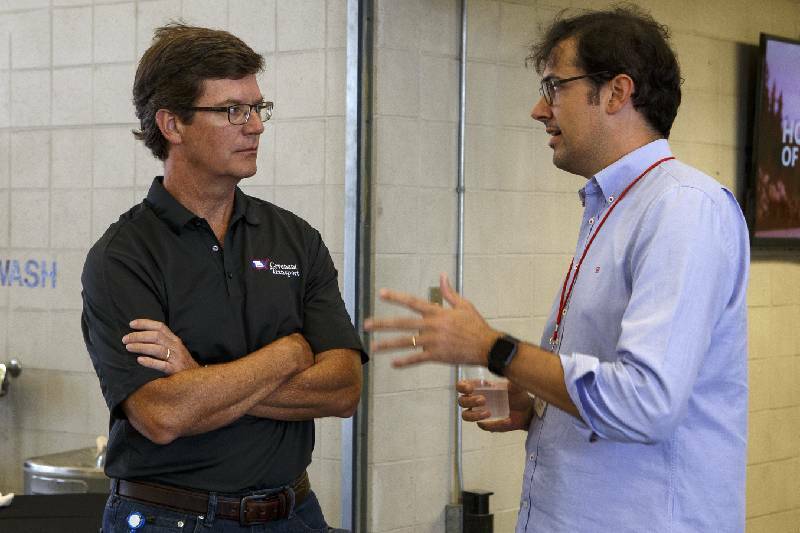 Covenant Transport President Joey Hogan, left, speaks with Logistics Exchange's Chief Technology Officer Stefan Friederichs during a Dynamo Venture meeting at Covenant Transport in October.